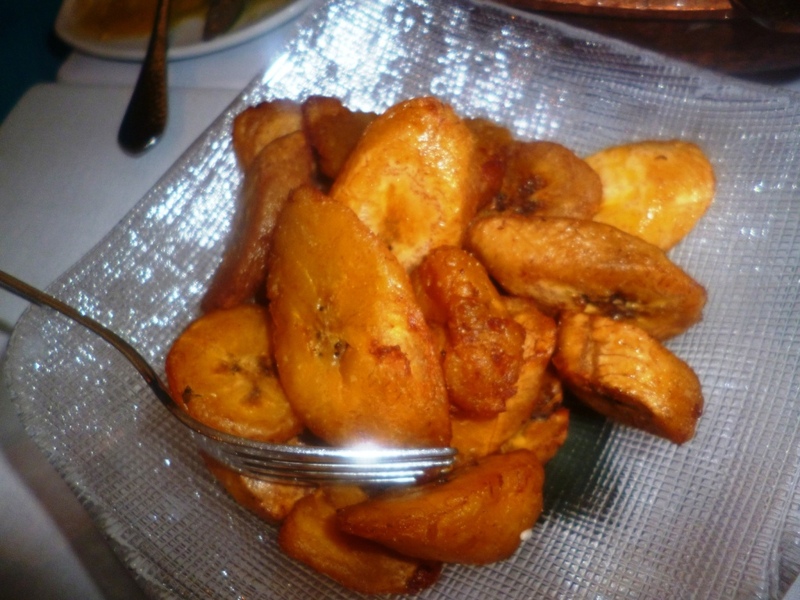 Forays of a Finance Foodie: Brunch At Pampano: You Just Can’t Say No! I was lucky enough to head over to Pampano yesterday to sample their highly popular brunch menu. This light and airy establishment with a lovely second floor terrace you can dine on for terrific midtown street views is co-owned by famous restaurateur Richard Sandoval and opera legend Placido Domingo. 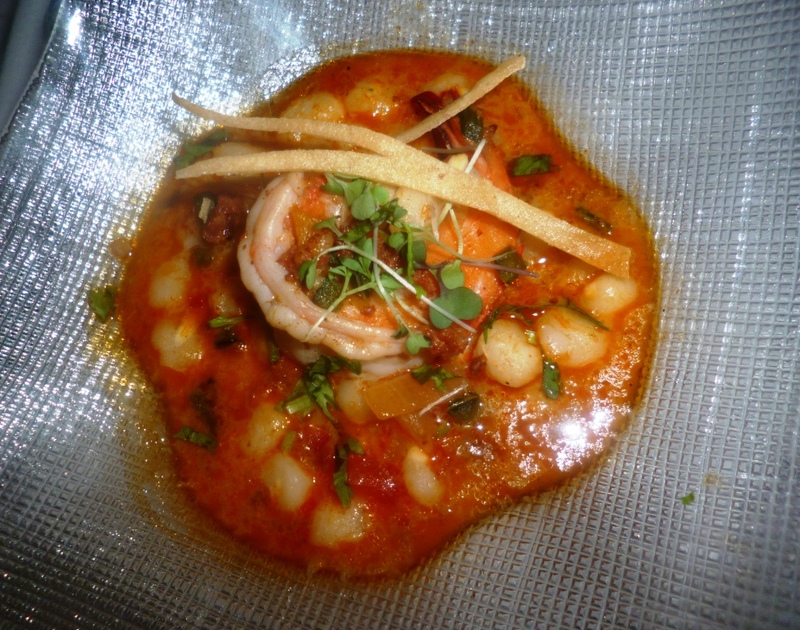 It is the site of the former Domingo’s and features some of the finest Mexican fusion cuisine in the city. It’s wonderful that the brunch, served only on Sundays from 11:30 to 3, offers unlimited small plates and “bottomless” freshly prepared sangria in both white and red. I’ve never had such good sangria before and the Pampano mix staff loads the pitchers with fruit including apple and orange chunks. The white sangria is particularly citrusy and refreshing and is actually more orange than white in color. It’s rare food and grog of this quality is offered in a $39 prix fixe, but it’s here at Pampano’s (children 12 and under are only $15 and are naturally offered soft drinks instead of sangria). 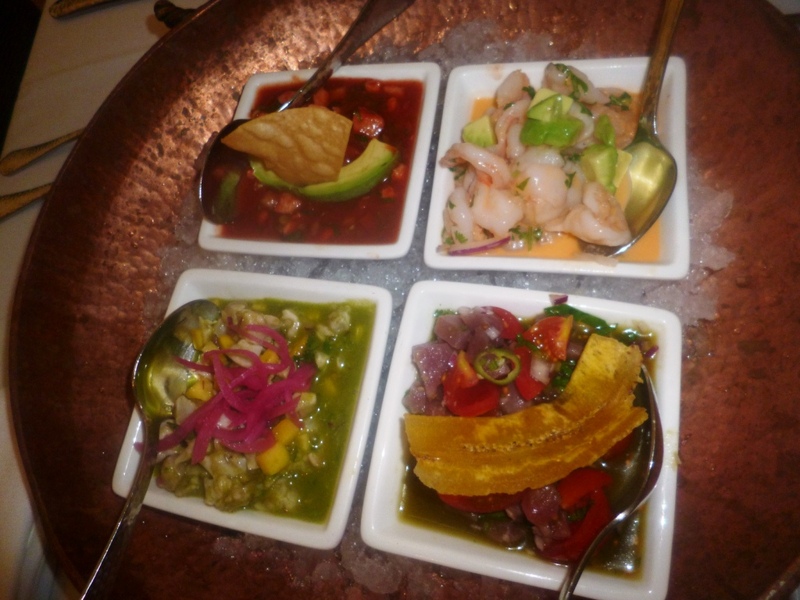 First thing out of the kitchen for anyone treating themselves to the wonderful Pampano brunch is a dish of four ceviches (Mahi Mahi, Big Eye Tuna, Shrimp and Halibut) done with many Mexican flavors including mango, ginger, mint and Chile Serrano peppers. I checked out several of these small plates, which included soup and dessert. I noticed that a couple of items were more like modernized soul food than Mexican, and they were quite delightful: Chicken & Waffles served with Maple Dijon sauce and Shrimp & Grits (the grits are in a cream sauce). Just eating two small plates of these items fill you up but I had to move on and eat more. The Pampano Benedict consists of sopes, black bean puree, poached eggs and salsa verde and was the most colorful item on the brunch menu. A couple of the regulars I spoke to the day I visited Pampano told me that they come on Sundays just to have the Benedict. Everything is served with plates of Platanos Fritos (fried plantains) and Chilaquiles (crispy tortillas topped with Monterey Jack cheese, Ranchera sauce and sour cream). 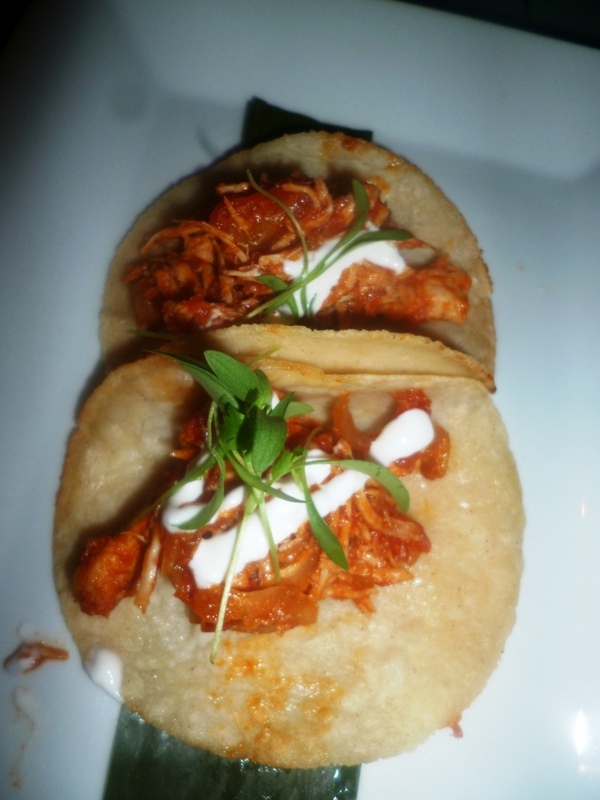 The Tacos De Tinga (chicken tacos) were among my favorite items—the tender slow roasted chicken is slathered with tomato chipotle sauce, and then served with lettuce and sour cream. 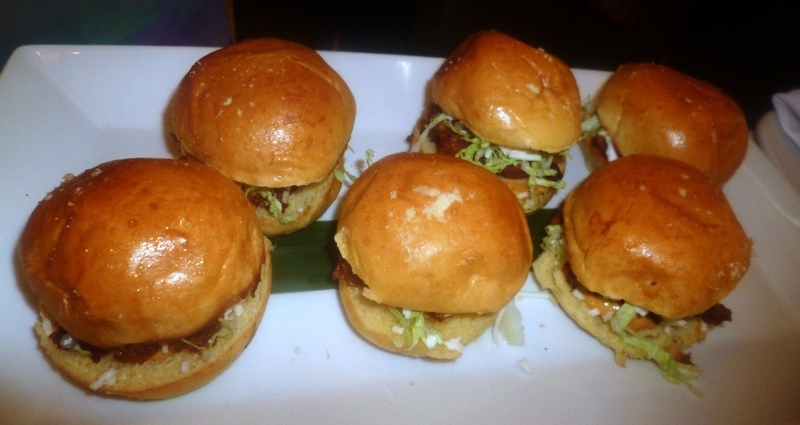 The Pambazos (potato chorizo sliders) were topped with lettuce and sour cream, served on moist hot fresh-out-of-the oven slider buns and had a wonderful smoky flavor. I finished the meal with a uniquely Mexican dessert—Sweet Corn Cake With Coconut Ice Cream in hibiscus sauce. The corn cake was soft and moist and the ice cream was not made overly sweet how coconut sometimes in. It was one of the most unique desserts I have had all year. So I take my (Mexican) hat off to chef Lucero Martinez. She balances traditional brunch food with Mexican classics and throws in some novel twists that delight at every turn.